How is meal planning going? Are your meals in order for this coming week? Do you know what you’re feeding your family? 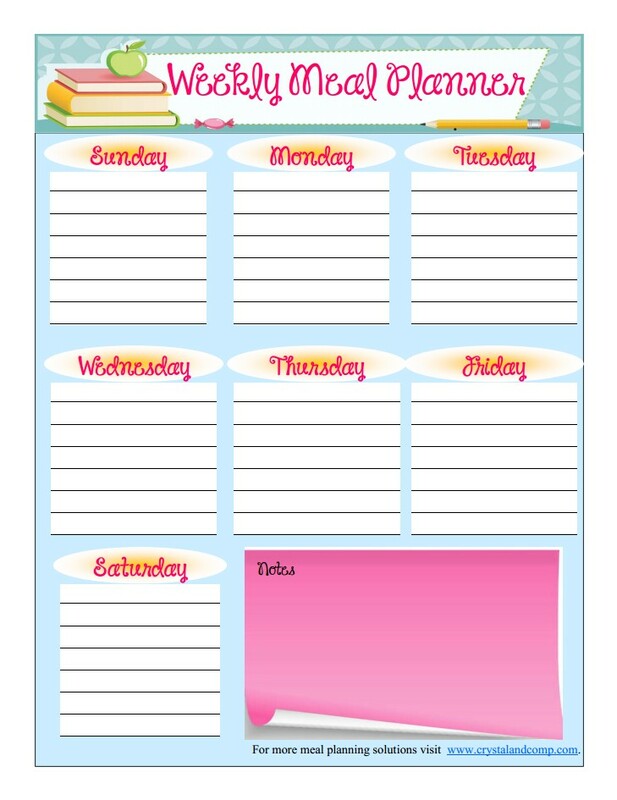 Here is a free printable meal planner that will help you map out your week. This one is perfect for the month of August as we get ready for back to school. I love that each day of the week gets it’s own area and there is even a place for notes. That is the perfect spot for starting next week’s grocery list. For more meal planning inspiration, check out three years worth of my weekly meal planning posts. This is great – just what I needed! Thanks for sharing! Happy to hear it Allison. Thanks for the menu planner. I love it. I am bookmarking your site. Have a great day. I am so printing these out!! It would totally help with my meal planning & they would look SO cute hung on my fridge! Cute printable! Stopping by from the Hearts for Home Blog Hop. I’ll be featuring this as one of my favorites next week. Thanks for linking up! Great printable for back to school moms! Stopping by to let you know I am featuring you tomorrow! Congrats! Thanks for linking up! This is FABULOUS! I have made my own, as well as used many menu planners printed from various resources. This is BY FAR my favorite so far. Thank you! Thank you so much Rebecca. That means a lot. We are in the process of making all of the printable meal plans for each month for 2014. Glad you like it. I love this, I am so happy I ran across this beautiful planner! Thank you so much!